"Small business optimism in Ontario took a nosedive in June." So begins the Ontario section of the Business Barometer from the Canadian Federation of Independent Business (CFIB). The members of the CFIB have legitimate reasons to be pessimistic. In this post I will demonstrate the indifference to the needs of employers in the current Ontario government's electricity policies, with a particular focus on the unfairness of the so-called Fair Hydro Plan. As context for the following information on rates in Toronto, the U.S. Energy Information Administration (EIA). American data shows U.S. residential consumers pay 86% more for a unit of electricity than industrial consumers, and about 20% more then commercial consumers. The definitions of groups don't work well in comparing to Toronto, but note small consumers pay, on average, the most per unit, and largest the least. On July 1st rates dropped for Ontario consumers charged on Regulated Price Plans (RPP), due to legislation dubbed a "Fair Hydro Plan" (FHP). I pulled average consumption levels for residential and other customers of Toronto Hydro from the spreadsheet accompanying the Ontario Energy Board (OEB) 2015 Annual Yearbook of Electricity Distributors, calculated average monthly figures and fed those into the OEB's Bill Calculator for Toronto Hydro customers. For non-RPP consumers (Class A and B) I found a Toronto Hydro presentation considering monthly figures for one consumer (on slides 19 and 20). There are some issues the presentation data, but the 18 cents/kWh for Class B consumers is what I expected. 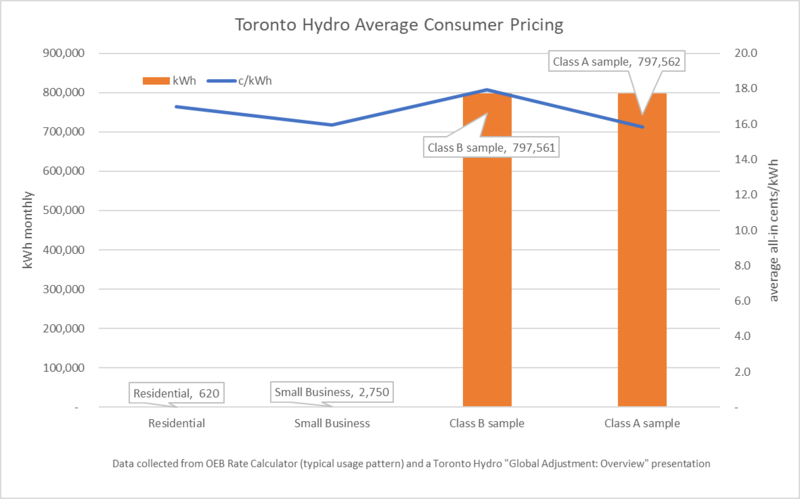 Not only do "Class B" industrial users not enjoy preferential electricity pricing, they probably pay more than the average Toronto household. This is exceptionally rare. I can find instances of American utilities charging industrial consumers more than residential ones, but nothing for a decade among utilities the size of Toronto Hydro with one notable exception: Niagara Mohawk Power Corp.  Ontarians might be interested in knowing the territory of that utility includes the American cousins of Niagara and St. Lawrence river power plants (in Canada, Beck and Saunders). Legal cases have established set uses for the power produced by the big public hydroelectric plants in the New York. Regardless, it's been 6 years since even that utility saw residential rates lower than industrial ones. 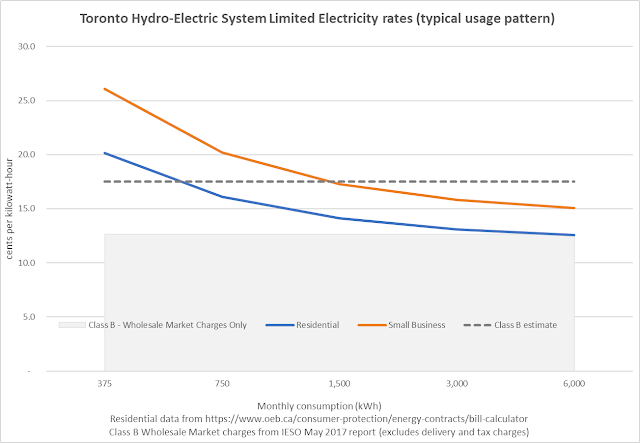 As uniquely unfair as pricing appears with this cursory look at average residential and small business consumers, and Toronto Hydro's mock-up of what are not-so-typical industrial ones, looking at a broader selection of consumers shows the situation is worse. Toronto Hydro's samples showed the Class A consumer paying 15% less than the Class B consumer for the electricity (kWh) component of the bill. The reality is that the difference is far greater, and increasing. 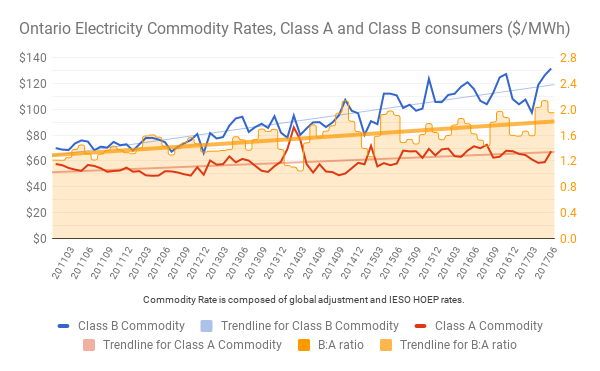 In recent months Class consumers have been paying half the rate of Class B consumers - continuing a trend increasing the discrepancy. The threshold for eligibility to enter the Industrial Conservation Initiative (ICI) - or Class A - was lowered. The result means that Class B consumers that move to Class A could see significant savings, but those that remain will be worse off as the cost shifting will increase more significantly than the minor savings from removing OESP, and reducing RRRP, charges. The ICI is but one way the government rewards the large at the expense of the small. Manufacturers have a reason to be concerned about cap and trade in that they'll incur costs competitors will not. While that is obvious in terms of inter-jurisdictional competition, it, as with electricity classes, also has to do with size: important large emitters are given free cap space (without disclosure of how much, or to whom), while small manufacturers are not. "There is more support being voiced than ever before for raising the minimum wage, including to the $15 level, by business community voices...There's a segment of the business community ... that opposes any increase in the minimum wage large or small." Well this is both misleading and useful. The highest-ranked concerns of Ontario's Independent Business (from the CFIB survey cited earlier) are a shortage of skilled labour and insufficient domestic demand, and the idea that boosting wages boosts demand has been around since at least Henry Ford's time. But whether the increase is large or small is not irrelevant. Writing in the Globe and Mail, a smattering of economist opined, "there is almost no employment impact from moderate increases in minimum wages." A more informative work on the Progressive Economics Forum includes, "600 of our colleagues in the United States...signed a letter urging the United States government to raise the federal minimum wage to $10.10 an hour from the current $7.25—in percentage terms an even larger increase than that from $11.40 to $15 in Ontario. A further letter calling for a staged increase of the federal minimum wage to $15 was signed by 200 economists." Rephrased in a strategically facetious manner; 600 felt a raise to $10 (similar to Ontario's current rate) was good, but only 200 felt a raise to $15 (Ontario's new figure) was. I think it's fair to say caution is urged in probing what is moderate, and I suspect it's not going to be the same throughout Ontario. Noah Smith's A Sign to Go Slow on the $15 Minimum Wage is sub-titled "If boomtown Seattle stumbles on a higher pay floor, imagine the harm in poorer parts of the U.S."
It’s crucial to remember that even if small minimum wage hikes don’t hurt the economy, there is some level of minimum wage that just won’t work. If Seattle raised its minimum wage to $10,000 an hour, for example, all legitimate economic activity would become impossible, and businesses could only employ workers under the table. I hope that the higher minimum wage is possible and positive - but I am not overly optimistic. I suspect it will be vigorously opposed by a business community that has little reason to expect fair treatment from Ontario's public institutions. I'll end this post with another analysis of Toronto Hydro pricing to demonstrate the prevalent anti-employer (business) sentiment. Using the OEB's rate calculator I pulled values for "residential" and "small business" consumers at a variety of monthly consumption levels. I included a couple of figures for Class B consumers outside of the Regulated Price Plan because only the wholesale market charge component of the bill is consistent - delivery charges vary widely based on consumption profile so the total is more speculative, although I expect it will average close to the 18 cent figure from the sample bill cited earlier. The simplest message from this graphic: a small business pays over 20% more for consuming the same amount of power as a residential consumer. The reasons a small business pays more, even with the same regulated price plan rates, is higher deliver charges and the continued collection of a debt retirement charge from them. There is no reason for businesses to believe the new debt that will arise from the so-called Fair Hydro Plan will not burden them in the future. It is also notable that the more a residence consumes, the greater the discrepancy between what they'll pay per kilowatt-hour and what a Class B consumer will pay. If a household managed to consume 4 times more than average, their average rate for power, delivery and tax would fall to only the power component of a small industrial consumer's bill. This too seems designed to push business under the table. The Fair Hydro Plan may combine with legislated wage increases to create a golden age for the residential grow op. 1. The EIA reports utility data by state and uses the name in this article, but the company was long ago sold to National Grid (a U.K. company).